Below is a photo that Dean Fabian sent in of "Little Mac" at the Harborfest, taking on his elders! The following came in from Art Connor of Mobile, Alabama. 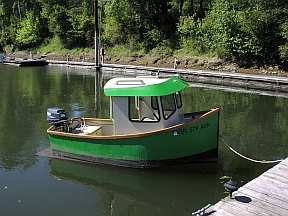 He built his tug, a Perfect 10, "Tender to the Gloucester" from Berk's plans. The "Tender to the Gloucester" is powered by a 50 HP 4 cycle Yamaha, three hydraulic helms (yes that's 3 hydraulic helms on a 10 foot boat! ), Shepeeli plywood covered on both sides with fiberglass, air compressor & air whistle, fully enclosed cabin, and both a Ham & Marine radio. 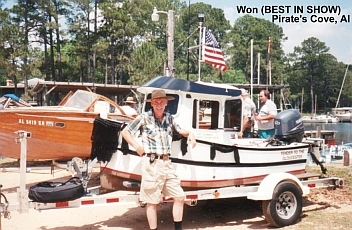 Below is a photo of Art's boat when it won Best in Show at the Pirate's Cove Wooden Boat Show! 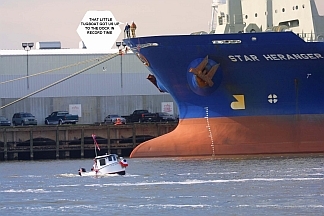 And here is another shot of Art's little but mighty "Tender to the Gloucester" taking on someone bigger than her! 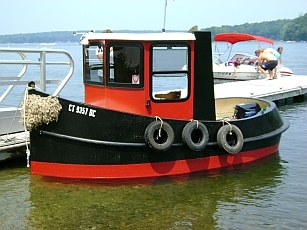 Here's a picture of our mini tug Seahorse. We ordered the plans from you just before Christmas '07, and completed the boat "so far" by early July '08. Construction went very well, using fir plywood from Home Depot and about 20 gallons of epoxy!. We followed your plans for the hull, but modified the wheelhouse design to fit some RV windows that were given to us. 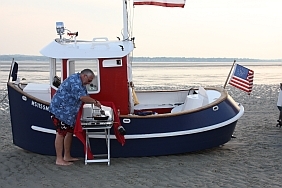 For power, we are using a Tohatsu four stroke 9.8 outboard in a well, and I can't say enough about how quiet and economical this motor is.We really rushed the finish on this project for the July 4th boat parade on Congamond lake in Southwick, MA. 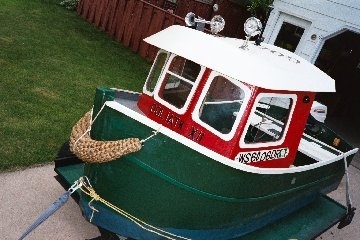 The boat received a quick "roller job" of rustoleum paint, and much of the wiring was completed at the dock the day of the parade. This winter, Seahorse will go back into the garage for a complete sanding and surfacing, cap rail, and completed interior. Plans are also in the works for an air system and pvc "steam" whistle.The little boat draws an incredible amount of attention. The first time we launched it, we were followed into the parking lot by people who saw us driving by. Once on the water, other boats started coming towards us like iron filings to a magnet, and we noticed people on the shore grabbing for cameras as we went by. By far the most memorable comment came out of the dark as we were returning from the fireworks after the parade. We were being overtaken by a pontoon boat full of people, and we heard an excited voice say "Hey...there's that little tugboat. That is the COOLEST boat ever!". 9/7/08Tom ShearerHi Susie,My wife and I just launched our Perfect 10 named "Mini-Linnie" (shown above) in Portland, Oregon (see attached). We are having a great time with her. TomGreat job, Tom! Thanks for sharing! Here is Little Bitts member Mike Magnant at Duxbury Flats, enjoying his "Toot Toot" the summer of 2008! Hope you guys had a great summer. We certainly did and had many great times on Toot Toot. Attached to this e-mail you will find a couple of pictures of one day out on the flats in Duxbury, Ma. The tide, as you can, see is out and we are high and dry. As we wait for the tide to "return" we barbecued ribs, steak and all the fixens before our return to Plymouth. Dave DeLott built one of the very first Micro 9's. 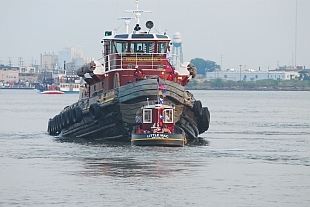 His boat was featured as one of the built tugs on the original Alan Locke website for the mini tugs. Dave has contacted us and sent along a photo of his beloved Goliath! He still has her! Here is the link to the original Alan Locke Mini Tugboat site!